It is huge honour for me to take part in the opening session of your Synod and to forward to you the brotherly greetings of the Conference of the Bishops of France. In this particular moment in history, we the bishops of France wish to manifest our closeness concerns and assure you of our support in the Lord. Thanks to the reports presented by our Brother Eparch Borys Gudziak, our Conference is perfectly aware of the challenges your country is meeting, in particular with respect to the worsening of the military and political situation in south eastern Ukraine, as the Minsk Accords are not respected. Our Conference has called for prayers, helping our faithful to realize the extension of the humanitarian crisis caused by the ongoing conflict, including a high number of persons killed, injured or thrown out of their homes and the destruction of the industrial infrastructure. It is true that in Western Europe we have little knowledge of your Church as well as of the catholic eastern Churches generally speaking. The media very often distort very complicated situations and give inaccurate accounts of what happens. I can assure you that the Latin hierarchy and the faithful support Eastern Catholics in this dramatic moment of your history. As you know an Ordinariate for Eastern Catholics in France has been established as soon as 1954, opening the way to the creation of the Exarchate for Ukrainian Catholics in 1960 and the Eparchy of Saint Vladimir the Great in 2013. We realize always more what a crucial role the Greek-catholic Ukrainian Church is playing in the concert of Catholic unity. A few weeks ago we were happy to hear of the start given to the process of beatification of the venerable Andrew Sheptytsky and so to learn from his life, projects and ministry. Metropolitan Andrew worked steadily for a Ukrainian Patriarcate of Greek-Catholics and Orthodox together, loyal both to Rome and to Constantinople. May Metropolitan Andrew be one day recognized as a visionary, even if the present stage of the ecumenical dialogue does not allow such a prophetic view. Your Church has the strength of centuries of martyrdom. It crossed periods of persecutions and miscomprehension even from part of your fellow Catholics. You live constantly under the threat of canonical claims mixed with nationalistic views from part of powerful neighbors. As I hosted a prayer evening in my cathedral in support of the persecuted Christians in the Middle East, I mentioned among the most dramatic current situations the case of the Ukrainian Greek-Catholics in the eparchies of Eastern Ukraine. You need our support and we need your spirit of resistance. The Eastern catholic Churches are magnificent witnesses to what catholic Unity means. It is admitted that deplorable endeavours to latinize Eastern liturgical or canonical practices belong to the past. I expect that the current reform of the Roman Curia will make more visible the specific link between the Apostolic See and the Eastern Catholics Churches, as being clearly distinct from the relationship between Rome and the Latin Church. Your quest to be recognized as a full sui iuris Church can only enhance Catholic unity. Full communion with the successor of Peter does not diminish but strengthen the canonical organization of the Eastern Churches. As a member of the Joint International Commission for the theological Dialogue between the Catholics and the Orthodox Church I can witness that there is still a long way for us to come closer together and to reach full communion. Too many factors, also non theological factors, have to be overcome. At the same time, we consider that the principle of freedom of religion, which is paramount in a constitutional state, has to be applied everywhere, specially where a Church claims for exclusiveness over canonical territories. Ukraine has suffered too much over the centuries from foreign dominations and experienced what means the loss of all kind of personal and corporate freedom. The Eastern Catholic Churches prove that national traditions do not jeopardize universality and communion with Rome. History has treated your people with hardness. It deserves a rest. I pray that this synod in the 50th anniversary of Unitatis redintegratio may help overcoming the gap of incomprehension from part of our Orthodox brothers. The Church belongs to nobody, but to Christ. If we all serve him and Him alone we will come closer together. Fr. Ivan was born in Lviv, Ukraine in 1988 AD. 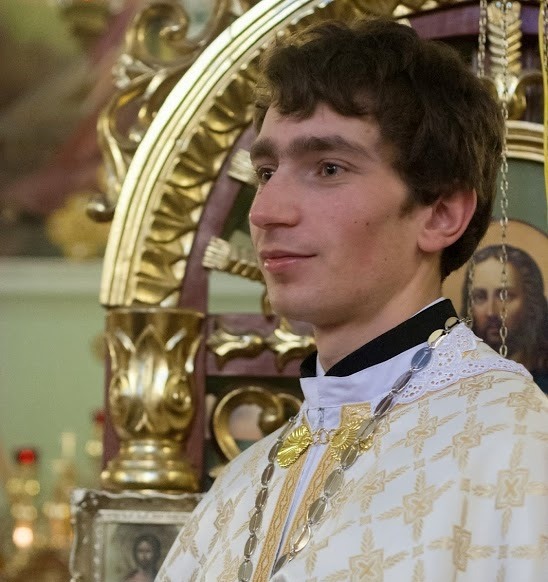 He graduated from the Lviv Holy Spirit Seminary in 2013 AD after he completing a Master's degree from Ukrainian Catholic University in 2012. On the 13th of October 2013 he received diaconal ordination from Bishop Benedict, the auxiliary Bishop of the Archeparchy of Lviv. On the 23rd of February he became a priest by the laying on of hands by Bishop Ken, Eparch of New Westminster for Ukrainian Catholics in British Columbia and Yukon in Canada. He arrived in Australia in December 2014 AD.